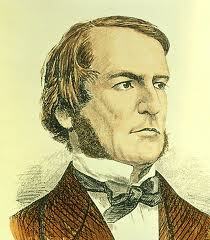 Today (8th December) is the anniversary of the death 150 years ago of George Boole, first Professor of Mathematics at University College Cork, and one of the fathers of computer science. The Service of Choral Evensong will take place at Saint Michael’s Church, Blackrock, Cork, the church attended by Boole and his family; he is buried in the adjoining churchyard. The Bishop of Cork, the Right Reverend Dr Paul Colton, will preside at the Service which will be taken by the rector, the Venerable Adrian Wilkinson and sung by the Clerks Choral. The preacher will be the Reverend Canon Dr Mark Hucknall, Chancellor of Lincoln Cathedral (Boole was originally from Lincoln) who holds doctorates in both science and theology. Among the distinguished guests will be Dr Michael Murphy, President of University College Cork; the Lord Mayor of Cork, Cllr Mary Shields; the Mayor of Cork County, Cllr Alan Coleman; and the British Ambassador to Ireland, Dominick Chilcott, CMG. This entry was posted in Anniversaries, Church in Society, Church Services, Diocese. Bookmark the permalink.